Let French bread cubes soak up the cream and egg mixture overnight. The next morning top it with pecans and brown sugar and pop it in the oven for a freshly baked delicious breakfast worthy of kings! Serve this easy yet impressive baked French toast with slices of fresh fruit, maple syrup, hot coffee and a side of bacon or smoked salmon for breakfast or brunch. Butter a 9 x 13 inch glass baking dish. Cut French bread into approximately 1-inch cubes. Spread cubes on bottom of glass baking dish. Thoroughly mix together eggs, cream, milk, sugar, vanilla, and cinnamon. Pour egg mixture over bread. Cover dish and place in refrigerator overnight. 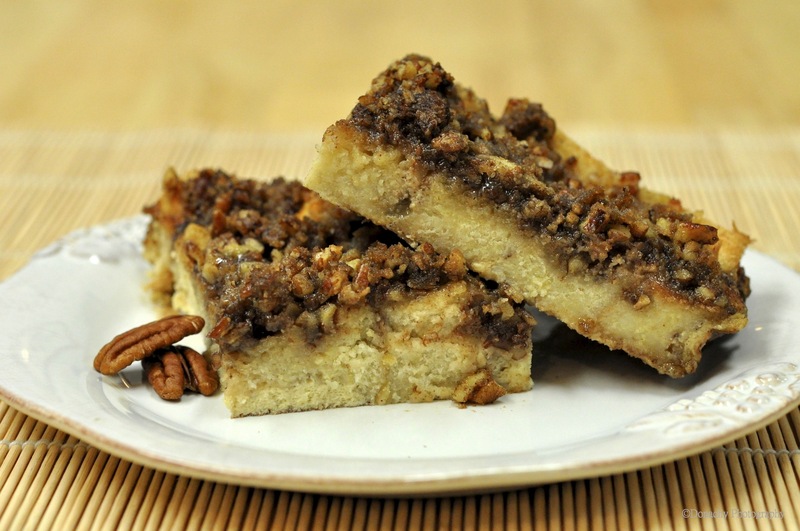 Bring bread mixture out of refrigerator while preheating oven to 350 degrees F.
Prepare pecan topping by mixing butter, pecans, and brown sugar. Spread pecan mixture evenly over bread mixture. Bake for 40 minutes, until golden and puffed. You might also like Overnight French Toast with Blueberries. Christ. I think that will just finish me off. 7 eggs! (going to give it a go though, with some smoked bacon). Looking forward to Sunday now. Hello Fellow Donachy Foodie… Enjoy the upcoming holiday meals! And thanks for reading! Reblogged this on What's For Dinner?. Lookin’ good – this would be a very tasty start to the day! One of my favorite things about Japan was the fresh salmon every morning. Very few people in KY understand it as a breakfast food. I am so glad to find someone who enjoys it as well. Your French toast looks divine! Yum! Need to try that. Good lookin’ Freedom Toast (just kidding). Freedom Toast… Ha! Love it! Oh, this will make you able to float in the pool but looks soooooooo worth it. We are up for trying this. Thanks!! !